VitaMix 5200 Review: Should You Buy One? If you buy one, I’m sure you’ll fall in love with this extremely valuable and easy to use tool. I love it so much, I bring it with me when I travel to visit family. They all love the yummy, healthy treats I make with it, and I can’t stand to not use it while I’m away from home. Let me share with you some of the details of this amazing blender. Have you ever thought about buying a high quality product and made the decision to buy a cheaper product instead? And then in the end the cheaper product didn’t perform they way you wanted so you ended up buying the better product later? I know, me too. Let me tell you, if you’re thinking about buying the VitaMix, don’t spend more money in the long run by going with the cheap option first. The cheaper models out there simply can not do what a VitaMix is capable of. This is exactly the reason why top chefs use and recommend Vitamix. It’s also the reason why any smoothie shop you go into most likely has a Vitamix blender. I can’t tell you how many processors and blenders I bought and used before buying the Vitamix. If I had just bought it first, I would have saved a ton on products that didn’t work well and that I never used because they were so complicated and difficult to clean. The Vitamix 5200 is an amazingly well constructed appliance. It is made is the USA. You’ll notice this in its sturdy construction. It comes with a 7 year guarantee. That’s the best guarantee out there on a blender. (In fact how many products come with a guarantee that is longer than 1 year these days? Not many!) No other company stands by it’s blender like VitaMix does. And if you take a peek on the web in cooking forums you will see people raving about their VitaMix that they’ve had for years and years! I used to buy a lot of prepared foods at the grocery store and I never really paid too much attention to price. I figured that these were food that were too complicated or time consuming to make myself. Now that I’ve become more health conscious, I have really learned how to eat healthy. And now my grocery bills are so much less. That really helps in this economy! On top of everything I found that cooking all these things is really not that difficult. Especially if you have a great tool like the Vitamix blender. Hummus – it’s fun to make different variations. Smoothies – I have so many variations of smoothies it’s amazing. I save $5+ everytime I make my own! Roasted Garlic Bean Dip – this is out of this world delicious, but without any of the guilt of most dips! Nut Milks – don’t knock til you’ve tried it. So easy, so cheap compared to store bought. Vegetable juices – your own homemade V-8. Control the taste, nutrients and the sodium level. Peanut Butter – easy? check! healthy? check! no poisons or germs or recalls? check! cheaper? check! Tahini – great for middle eastern recipes! Pâtés– if you like meat pâté, but would like a cheaper healthier yummier version, it’s a snap! Frozen drinks! – pina colada anyone? strawberry daiquiris? Fancy Coffees – saving $3-5 with every yummy drink I make! Salsa – so fun to experiment with different kinds. Salad Dressings – I never buy salad dressing anymore. The ones I can make are so much yummier, healthier, and cheaper. Ice Cream – Move over Ben & Jerry! Design your own flavors! Italian Ice treats – again make your own flavors. My favorite is coconut ice made with real coconut! MMMMmmmmm! Cheese Fondue – make it and cook it all right in the blender! Spinach & Artichoke Fondue– mmmm! Pancake, crepes, and waffle batter – no lumps! Baby food – please, don’t buy the little jars anymore! Save yourself so much money and grow your baby so healthy! You can make a batch and freeze them. Each night take a few out of the freezer to defrost for the next day. Grind your own grains – talk about making food cheap! This is done with the dry blade container. Green Soup – will change your life. Get healthy and skinny! Broccoli Soup – delicious French recipe that is also healthy! Sore Throat Remedy – cured my sore throat in 1 day. Seriously! All these recipes (over 300) are in the free recipe book you get when you buy the Vita-Mix 5200 blender. You’ll also find many recipes right here on my blog. As they become available, I will add links above. The more you use your VitaMix, the better you become at coming up with your own recipes! Do you want to be healthier? Do you feel overwhelmed at the thought of changing how you eat? Has this been keeping you from making any changes at all? Let me comfort you by saying there is a way to make a change and have it be easy. In my book on healthy living I recommend taking one small step each day to become healthier, such as learning one new recipe. The Vitamix 5200 makes it so easy to do this. Vegetable Juices – better than juicing. Get all the nutrients plus keep the fiber too. Fiber keeps you healthy and trim. When fruits and veggies are blended into very small pieces, your body is able to derive 3 times as many nutrients than if you chewed it yourself. Don’t like eating green veggies? Drink ’em! Delicious and fast! Mix them into both veggie drinks (homemade V-8) and fruit smoothies. Get more nutrients from fresh produce than from processed foods that have stripped all the goodness out of the veggies. It’s so easy to use, you’ll want to keep trying more recipes each day. No more trans fats, high fructose corn syrup, and chemical preservatives in your family’s food! Spend less time checking labels for bad ingredients now that you’ll be preparing your own food. The VitaMix’s 2 Horse Power (1380 watts) motor is so powerful that processing your food literally takes seconds. No chopping before adding them to the VitaMix. This blender can pulverize anything even large frozen chunks of fruit and ice in seconds. Clean up takes 20 seconds, literally. Fill with water soapy water. Blend for 10 seconds and rinse out. That’s it! Really! There’s no disassembling the machine into multiple dangerous parts. Actually cooks foods like vegetable soup in minutes, due to the amazing power of the motor! New Eastman Tritan™ copolyester 64 oz. container is as durable as polycarbonate -now with improved sound damping and is chemical resistant (when cleaning your Vitamix). Comes with ergonomic soft-grip handle. And No BPA’s! New Swedish-built 2 peak HP motor, custom designed for this machine, runs substantially cooler with energy savings and improved performance. No attachments make this blender super easy to use! Unique stainless steel hammermill and cutting “wet” blades process whole foods like no other appliance to deliver up to 3 times the nutrition. Patented tamper for extreme processing power helps when preparing foods such as nut butters and frozen treats. What about other blenders? Like I said above, don’t even bother with cheaper, noisy, powerless models. You will just be wasting your time and money. If you are considering another high-end blender such as Blendtec, here’s why my final decision was to buy a Vitamix. The warranty on the Vitamix was much better which tells me the quality is better because who knows a product better than the company selling it? Also, I did a lot of research online, and although there are positive reviews of Blendtec blenders out there, on the whole I found an overwhelming amount of positive reviews of Vitamix and more reviews of Blendtec that expressed disappointment in its performance. To give you an idea of how happy I am with my decision, I have never had a single regret, as can sometimes be the case when I make large purchases. I receive excellent value from my Vitamix blender everyday. I love it! The VitaMix 5200 is definitely an investment, yes. But, as mentioned above, it is an investment that will save you money in the long run and help make you healthier with ease! How much is that worth to you? For me, being healthier and having it be easy to do is worth the price alone. Isn’t it time you bought something for yourself that will give you back true value? To order a VitaMix online click here or on any of the links above. If you prefer to order it over the phone, please mention this article and mention this code: 06-003178 and that you would like free shipping. Using this code will make you eligible for the free shipping . The phone number is 1-800-848-2649. You’ll find the sales professionals at Vitamix to be so helpful both when you purchase your blender and after if you want any guidance. Hopefully my article has been valuable in helping you to take another step towards a healthier life! I wish you happy healthy eating! Please share your VitaMix experience with us here! And be sure to subscribe to get updates on new healthy Vitamix recipes in the future for free!! 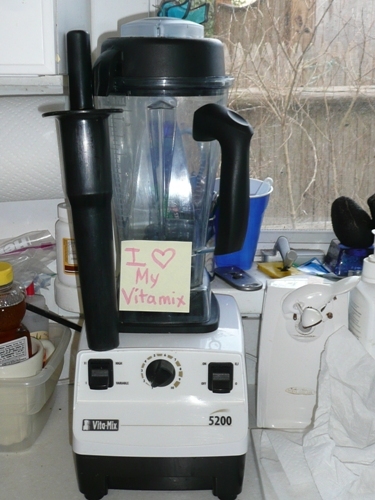 Do you have a great recipe or Vitamix testimonial?All comments big and small are very welcomed! If you found this post valuable, perhaps you’ll be kind enough to vote for this with a Stumble or Delicious bookmark. Votes are always appreciated! Please note: This is not a paid review. I am sharing it because I know how much my Vitamix has helped me become healthier and hope that it can do the same for others. If you do use the free shipping code(06-003178), I do receive a small commission from vita mix. Thank you for your support!